EACH of us has a perspective on life, a perspective that is so tied to our sense of being we take it for granted. Every movement, action and reaction we enact throughout our day, and every event that occurs, we interpret through a filter made up of all the ways we've learned to explain the world to ourselves. We assume that the meaning we ascribe to people, places and things is the meaning they embody. The way we see things feels normal and so must be reality. Some might say that our perspectives are based on our experiences. But the way we define our experiences depends upon our belief system - beliefs that were shaped, to a great extent, by how we were brought up, the examples set by our caretakers and how we interacted with them. Perhaps the vast majority of us don't question how we see things, and that others who don't see things as we do are wrong or misguided. As long as we feel that life is working for us, we can keep our assumptions and continue to define the world in the way we always have. But what happens when circumstances, events, or someone - like a horse, for example - comes along to challenge our viewpoint? Are we curious? Interested to learn more? Intrigued? Initially, we are more likely to be annoyed, irritated, angered, humiliated, hurt, incensed, bored, disgusted, miffed or in some way motivated to defend our "original" point of view. After all, what we know is obvious, right? A number of years ago my life fell apart in a big way. Actually, it had fallen apart a very long time before that, I just wasn't ready to admit it. 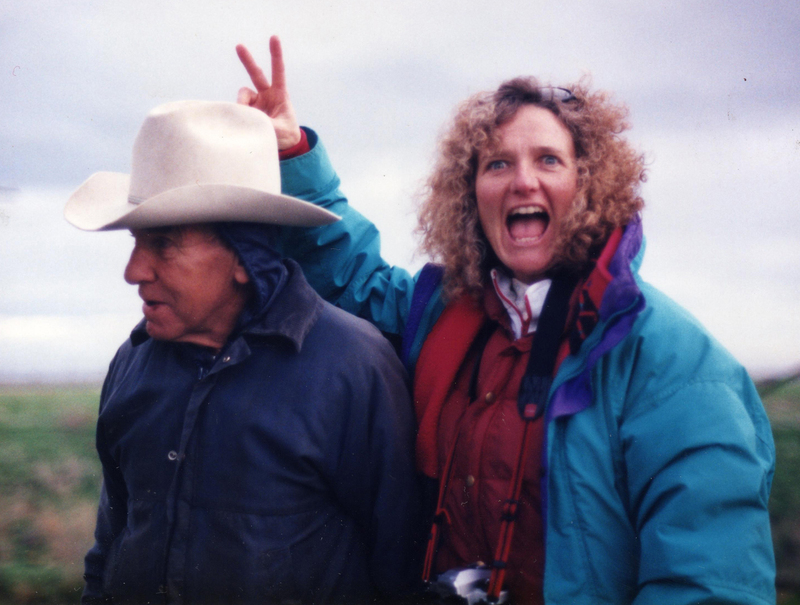 An 80-year-old cowboy named Tom was a big part of my ability to redefine that experience. 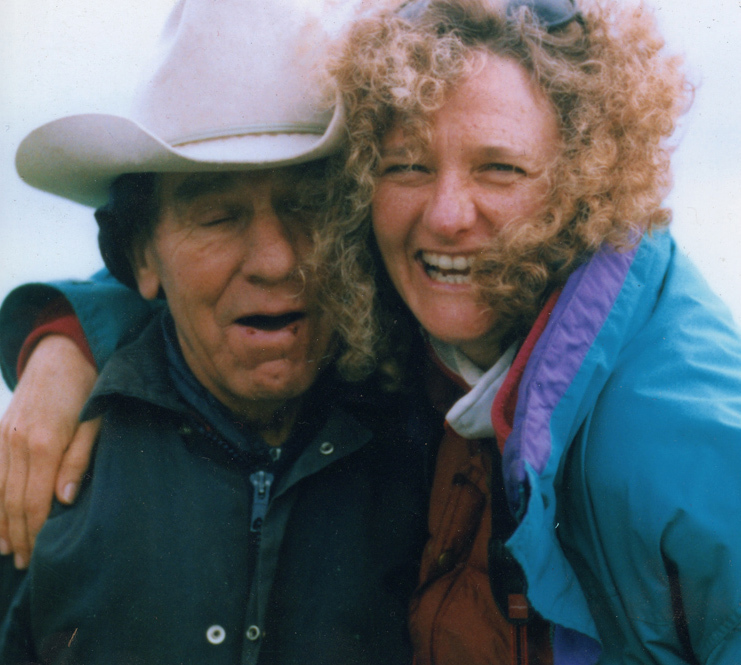 He helped me realize I could learn a different way of viewing the world - from a horse, no less. 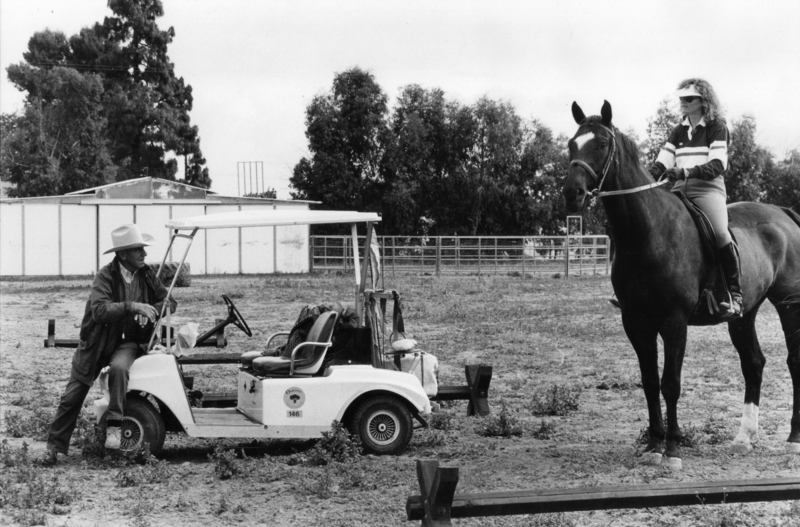 At first, Tom allowed me to think that the "new" ideas he was presenting were all about my horses. But at one point it occurred to me that how I saw my horses said everything about me, and very little about them. I couldn't actually apply a "new" idea to them without challenging my frame of reference. So what would possibly motivate me, a "successful" trainer with a well-established business - not to mention ego - to begin to take a humiliating inventory of my manner, behavior, demeanor, attitudes, and interactions with others, and realize they weren't working? For me there was only one answer. The degree of pain and alienation I felt by not doing so had become too much to bear. Even then, had it not been for Tom and the horses, I wouldn't have known there was any other option than the one I already knew. Tom understood that the horse is uniquely suited to helping us humans learn about ourselves. The question might then be, "Who are we?" Are we that person we have the potential to become, or what we have actually made of ourselves and our lives to date? Most of the people I meet feel that what they have made of themselves does not match who they would ultimately or ideally like to become. When we consider, then, all the many positive qualities or character traits that describe our human potential (such as patience, natural curiosity, generosity, inspiration, strength, creativity, courage, sensitivity, a sense of goodwill, and empathy, to name a modest few) we also find the opposite or negative face of those qualities (impatience, a need to be right, egotism, living in a rut, fearfulness, defensiveness, mistrustfulness, selfishness) and all of their infinite variations. It has been argued that we each have a choice, ultimately, about which possibility we choose to embody at any given moment. But from a practical standpoint, most of us generally respond or react to any given situation based on what we know, or what we were exposed to and then adopted for ourselves. And here is one of our more obvious links to the horse. They are ever doing the same. 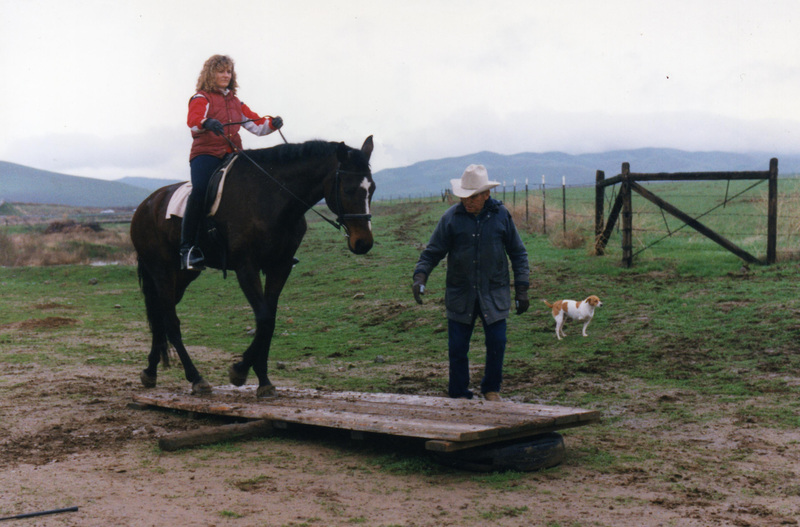 Horses were not the only medium Tom used to help people, but the most common and, I learned, for good reason. In order to survive the past several million years as a preyed-upon herbivore, horses would have been compelled to hone their capacity for detecting the faintest sound, the mildest smell and the slightest touch. In addition, navigating their place within the safety net of the herd necessitated knowing how to get along with other members by learning to read every facial expression, bodily demeanor, and internal posturing - from a distance, no less - which would express the intention of another. These highly developed sensitivities merge with their strength, stamina, fortitude, athleticism, courage, speed, and deftness. Much like a martial artist, their capacity to adapt to an ever-changing environment requires them to react quickly, a response made possible by the ability to live in the present moment and notice everything. So, enter us humans. Before we can get within 50 feet they already know quite a bit about us. It's those millions of years of training they've had. Only most of us don't start off knowing that they know because they appear not to be looking. Unlike a dog, a horse doesn't eagerly bark and wag their tail as we approach. We assume that means they don't care or are too dumb to notice. That's our first mistake. Then, all of the areas we've focused so much time on, like what we're wearing, what we do for a living, what kind of car we drive, how big of a house we live in, what time it is and how much time we have left, how much money we make, our ranking in society, and what things look like on the outside, they care nothing about. Horses do not live in fear of tomorrow's scarcity nor are their motives managed through guilt and so they do not question or have a need to dislike themselves. The absence of shame eliminates a need for lying or hiding their emotions, so what they feel on the inside is what gets expressed on the outside, even when that expression appears to be no expression. We humans, on the other hand, have myriad complex strategies - conscious and unconscious - to hide, secret away, manipulate, deny, obscure, contradict, repudiate, dismiss, counter, contest, rebut, controvert, renounce, abandon, discard and disown what we are actually thinking and feeling, and make it appear that what is actually happening is not happening, and that the onlooker - perhaps it's you as well - witness, bystander, acquaintance, associate, partner, teammate, collaborator, friend, spouse or significant other is crazy for thinking otherwise. But the inner conflict that inherently arises underneath the smooth facade of those of us who appear to thrive on deception, whether intermittent or habitual, is what the horse is ever responding to. Most of us have come to believe in what we tell ourselves about ourselves and who we project out to the world. After all, it's what we know and it feels normal. But the horse sees us from a different perspective, and so when we think we are projecting a certain intention, the horse is responding to the inner conflict. We send mixed messages that we don't realize we're sending. What we notice, however, is that the horse isn't responding to what we think we're asking for and so, needing to be "right," we blame them, telling ourselves that they are misbehaving, pre-meditating disobedience, or just not listening. In my case, the fact that the horse didn't care that I knew I was right only made me madder. Armed with my fury, I'd come after them to serve their comeuppance. Motivated by a need for survival, their highly developed, multimillion-year-old sensitivity suddenly turned to strength, and there I was, doing battle with a runaway or a brick wall and everything in between. I learned the hard way that the strategies a horse has for escaping the denseness of the human are endless. 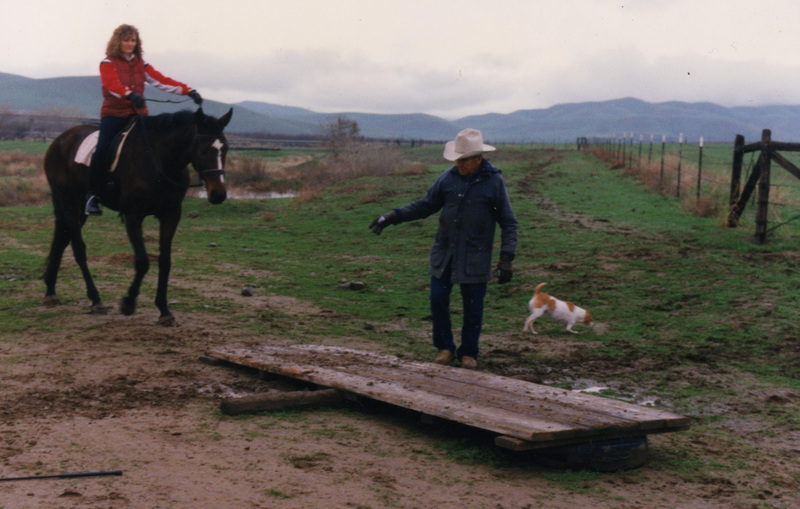 With Tom's help, I learned to recognize that my old assumptions for what constituted "normal" were not really useful for defining the horse or interpreting his actions. I needed his intervention because without it I might never have had the courage to deconstruct the stories I used to define who I was. But Tom, like the horse, didn't judge my imprudence. Instead, he offered a place of emotional safety. His recurring "suggestion" was that I learn to avoid trouble, and then he, along with whatever horse I was working with, simply awaited that moment when I, after a lot of groping, would realize a new option to an old situation and take one step closer to reality, i.e. the way the horse saw the world. Learning to talk about these "new"experiences gave me a momentary sense of self-importance, but I found that I was essentially who I had been before my ife fell apart. Tom, on the other hand, was ever patient and kind and appeared incredibly at peace inside his own skin. He could demonstrate everything he suggested to someone else without hurry and with a sense of unperturbed confidence and ease. Noting that, I knew I had to go further. My admiration for his mastery was the motivation I needed to renew a process of digging deeper. The safe haven he provided allowed me to continue to feel awkward and stupid trying something different, and in that process I began to think creatively. I began to problem solve. After a few years I woke up and realized that what had once felt like my life falling apart had transformed into the best thing that ever happened to me. I found that to learn without being judged was inherently fun and interesting. Being rewarded for my interest, not merely an occasional accomplishment, allowed me to feel free to experiment because I was no longer afraid to make a mistake. When my experiments went bad, Tom did not criticize. In fact, he rarely told me what he thought. He simply allowed the horse (or whatever else might be handy) to help me demonstrate a better idea. He trusted that my own intelligence (another virtue) would allow me to recognize my mistakes, and that my inherent desire to succeed, no longer squelched by my fear of failure, would allow me to try a different solution. The more confident I felt the more mistakes I made, but the need to prove myself subsided. I looked to Tom less and less for reassurance and began to rely on the horse to inform me. 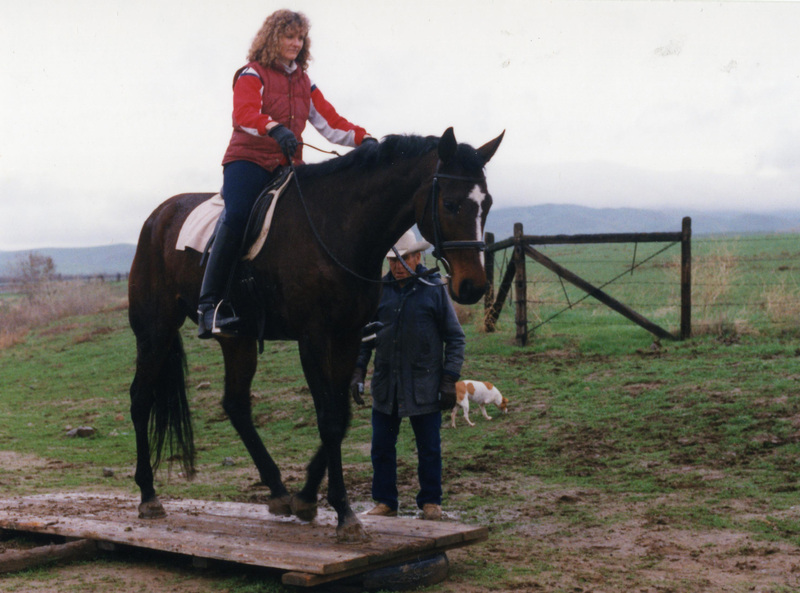 Without his initial trust in me, however, who knows how long I would have continued to assume an answer before I understood the question, manipulating or micro-managing myself and my horses in order to appear like I knew something. How freeing to realize that I didn't need to have the answer! Rather, I needed a willingness to explore what presented itself in the moment - and then adjust myself accordingly. At the time I didn't know that I was being healed. But what I did notice was that my horses began to come around (oh, how much easier it is to see what's going on in someone else's life). I saw them become more relaxed, and with that relaxation have less of a need to brace or armor their bodies against me. Their lack of confusion allowed them to focus, and with that focus came the ability to discern my meaning and know what I intended for them. With their trust came an eager willingness and a desire to be with me. It was much later that I finally began to feel a slow melting within my own being due to the gradual letting go of the manufactured ideas I had about myself, my horses, and my life. As I began to feel moments of patience, trust, confidence, being unhurried, more sensitive and compassionate, I did not feel like I was "becoming" someone different. I was realizing what had been a part of me all along. There was no force in the process, no reprimands or setting of goals, no following a schedule. Those virtues and qualities that I had once thought needed to be superimposed onto all of my actions were already an intrinsic part of my nature, there for me to embody whenever I could find a way to let go of trying to be someone or something else. Today, I continue to emerge in layers. I am hardly ever consistent for long. But working with horses continues to be my laboratory for experimenting and then honing a mind-set that's hopefully a little more appropriate to the moment than what I'd thought of yesterday. The ongoing challenge is doing the same with people and events I encounter every day. It sure feels more difficult and complicated, but doable. And it's comforting to know that we humans have the ability to find our true nature of being, especially with our horses showing us the way.